The Sun is our nearest star giving us the light and energy needed to sustain our lives. The Sun is very active with many magnificent features and events continuously observed on its surface and up in the atmosphere. For instance, solar flares are the largest explosions in the solar system that take place in the outer layers of the solar atmosphere, release enormous amounts of energy in the form of electromagnetic radiation and energetic particles, equivalent to millions of hydrogen bombs going off in a matter of minutes. Large flares can have the most significant effect on Earth. They can cause long-lasting radiation storms in the upper atmosphere, trigger radio blackouts and the occasional minor radiation storms. As magnetic fields are responsible for most of solar activity and its effects on interplanetary space, at the E.A. Milne Centre our research centres around solar magnetism. Our group leads the research into flare seismology and sunquakes: during the flare, most of the energy goes up into interplanetary space, but a fraction of this energy travels down to the Sun’s surface, creating a sonic boom that causes the solar interior to oscillate and occasionally produce ripples on the surface, not entirely unlike stone dropped in a pond. One can think of sunquakes as thunder to the flare’s lightning, except imagine a lightning over an ocean that is so strong it creates a tsunami. Also, much like geologists use earthquakes to understand the internal structure of our planet, we also use acoustic waves, like the ones produced by sunquakes, to learn more about the internal processes of the Sun through technique called helioseismology. And from our solar studies we also to learn about the fundamental physical processes taking place in other stars. So, we use variation in the intensity of distant stars to detect stellar flares, search for star-quakes and learn about star’s internal structure using asteroseismology. 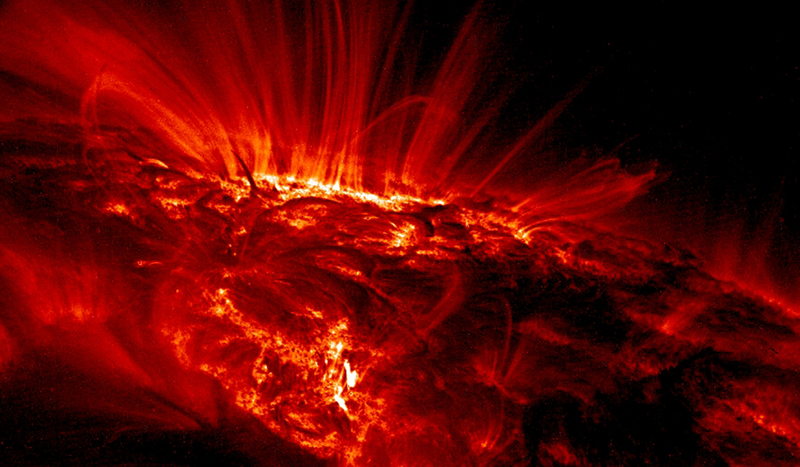 Image: Sunsport observed by NASA’s sun-observing TRACE spacecraft. Credit: NASA/TRACE.